We send Any Hero notes when we have them, and those receiving the box of cards try to make sure that those service men and women who don't get mail from home receive one of those notes. Well it has come to our attention that our service men and women also don't always get a birthday card on their birthday. How depressing would that be??? Here you are thousands of miles away from home, serving your country and your birthday rolls around with no mail. Now.....that is probably not because your family didn't think about you and mail you anything.....it most likely is because the mail delivery has been delayed. Turns out some of our recipients have been stashing some of the birthday cards to have fellow service members sign so that they do get a card on their birthday. So it's 25 + 2 for summer! SO........your challenge is two fold. Next time you send one of us a package of cards, we would like you to try to do these two things. Now if everyone sends these two cards with each package that you send in, we will have a good supply of notes to send with each package. There are times we have no Any Hero letters to send and that is just a shame. With summer coming, think about those picnics or gatherings you might be going to for Memorial Day, 4th of July or Labor Day. Bring some cards and pens........lay them out and tell people about them. You might just be surprised at how many would be willing to take 5 minutes to write a short note. They've wanted to thank a hero and might have been too awkward to do it in person, but a note is the perfect opportunity to share what they want to say! When you mail these notes to us, make sure to leave the envelope unsealed as we need to be able to look at them first before mailing. We hope you will accept this challenge. Trust me when I say......It will bring a smile to lonely hero's face!!! A nice article was published about CK's card drive at their event recently; check it out by clicking here. It's a great "template" for an article if anyone's holding an event in their community . . . contact your local paper and see if they'll publish a story about your efforts! Here's a tutorial intended especially for new cardmakers—but hopefully with some tidbits for all levels of crafters. If you post a card made from this tutorial on a blog or in a gallery, leave a comment on this thread with a link, so we can all go check it out! Take a look, another successful CFH event! 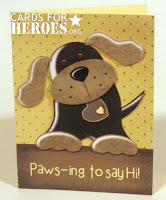 Cardmaker Keri was sent a link to our video (on our homepage now) by cardmaker Lisa R—and it so inspired Keri that she organized a Cards for Heroes cardmaking party at her church. She wanted to have her crafting friends and family join her in this; "I knew it would be a good idea for us to hold a party!" "Did we ever have fun!" Keri says. They had almost a dozen women in attendance throughout the time set aside for crafting. These fantastic ladies produced a grand total of 275 cards to send to our heroes! "It was a very fun, and fulfilling day for us all," Keri says; and now just imagine the 275 heroes, plus 275 loved ones, who will be blessed by that fun! Check out more pictures from this event in our Events Gallery, and visit Keri's blog post about this party by clicking here. 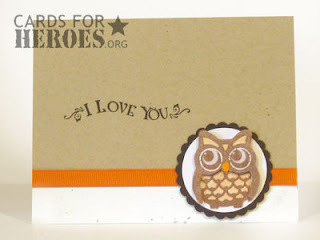 Make a commitment to write AnyHero cards in Rick's hono.. Make sure no hero goes without a thank-you from the homefront. Send them to any shipper—it can be one, a few, or many. It can be just you, your family, or your club, school, or church. Make a commitment to make blank cards in Rick's honor. Bless other heroes and help them keep in touch with their loved ones. Choose an amount that works for you, and think of this fallen hero while making them. It's up to you how you might feel compelled to honor him and all the other young men and women putting their lives on the line for us all. If you want to make a public commitment that the family can read, you can post it as a comment on this thread, and/or click here to view and sign their guest book. 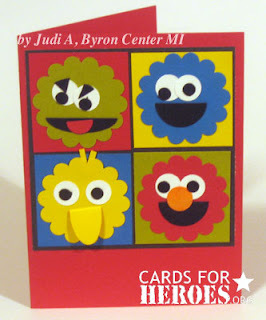 During the interview, Phyllis Zimbler-Miller and Nancy Brown learned a little bit about cardmaking...it was fun sharing with them about what we do, why we do it, and how it all gets done. Nancy even volunteered to be a shipper-on-sabbatical for us! Some of our letters from the Hero Blog were read, stories shared, and plenty of basic information was given in the interview to inspire more people to join us in this cardmaking adventure! A little "behind the scenes" story about how this interview came about...I (Sandy) was looking for a hero who'd come home a while back. We'd supported him over his deployment on a ship, and since he was stationed near me I hoped to find and meet him sometime. 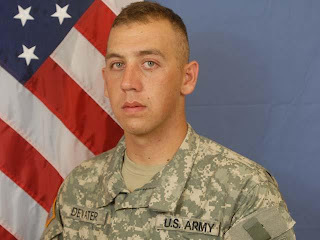 I had received him as a contact first through a Jewish connection, so I was searching for organizations that specifically support our Jewish-American heroes, to see if anyone knew him. I periodically googled him to see if he'd show up, but hadn't had success. Yet. (Okay so I understand this is probably sounding like stalking by now. Really, it wasn't!) I emailed Operation Support Jews in the Military to see if he was on their lists, and Phyllis is the one who emailed me back from there...she didn't know him, but proposed an interview once we talked about CFH. The story continues to get better. A radio interview on NPR with an author caught my attention; the author spoke of her husband, his deployment on a ship, approximate dates, his first name...and I became so curious! I found a link to the author's book website, emailed her, and found out it was indeed the wife of the hero I was searching for! And hopefully later this year, Alison will be interviewed by the wonderful Phyllis and Nancy on their show. And in a few weeks it's possible I might get to meet their whole family! Please feel free to share any of these links on your own blog, facebook, or twitter so we can get the word out to more people! Our card donations have been slowing down (nice weather? spring break?) so we're hoping to generate some interest with whole new circles of crafters, so help us spread the word. Share your links with us, too—we'll add them to our twitter feed and other locations on the web! Phyllis Zimbler-Miller and Nancy Brown of Blog Talk Radio's Your Military Life will be interviewing Sandy on Wednesday, all about our work here at CFH. Click the graphic to go to their site for details—you may want to check out their site and call or email questions for the program! We'll post a link here after the interview—but you may want to check out their other interviews and sign up for their podcast, which highlights interviews on all sorts of military-related topics. In case you missed it...April is the month of the military child! We're hoping everyone might get in the habit of making a few cards for kids in each shipment sent in...our heroes love to write home to their children! This post has a few samples of kid-friendly cards we've received recently...be inspired, and share links to your great kidcards too! If one of the unattributed cards pictured here is yours, email info@cardsforheroes.org so we can credit you with your design, or we'll remove it from here at your request! We lost track of the cardmakers — names were only on the backs of a couple of these. These cards can be for birthdays (we already do get some birthday cards for kids on occasion) but they can also be other themed cards. Think about your own children or grandchildren, or any child you know, and what you'd say to them on any regular basis...Proud of you, Love you lots, Missing you, Great job, blank with no sentiment, or just a hello! Get out your bugs, aliens, sports, and cowboys for the little men at home, and princesses, butterflies, kitties, and a bit of bling for little girls. Sesame Street, Disney, or dinosaurs—licensed images are a hit with kiddos. And sometimes just colors or paper patterns will make a card kid-friendly when the image itself isn't too child-like. These cards can even show off a sticker in its best light! Ages for our service members' kids are varied. Little kids love to hear from Moms and Dads overseas as well as their big brothers and sisters; if you've got great ideas for teen cards—those seem to be the hardest for most folks, so give them a try. Note that these are cards for children—not cards to "mommy" or "daddy" from a small child. We don't have too many kids serving overseas in our military, so cards to Daddy aren't very helpful. We've started a thread on the CFH Discussion board here—post a link to great ideas you can share. These can be your cards, or great kid-cards you've seen on other blogs, or in other galleries....the more ideas we have, the more creative we can all get! April 5, 2009, Tukwila WA — A number of cardmakers from the Washington area south of Seattle (and one visiting from Nevada!) gathered their cards together and showed up on Sunday. The cards were so beautiful! Those visiting that afternoon had an opportunity to peek through the donated cards and get inspiration from each other. The cards represented so many styles, from photographic cards to highly embellished, clean and simple designs as well as complex folds. Each was a treasure! And, seeing these pictures, we're sure you want to know the final count. How many were collected in this one event? 1047 cards! Yes, isn't that amazing! Many many thanks to those who donated cards, finances, and their time and efforts—as well as Laura and staff at Paper Zone for organizing and promoting this card collection day! If you'd like to organize a card collection day at your local stamping, scrapping, or paper goods store, contact us at info@cardsforheroes.org and we'd be glad to help with advertising and resourcing you with flyers etc!